Le Camping Saint Martin ?Barr, Alsace, est idéalement située au cœur du vignoble alsacien, ?proximit?de Strasbourg et de Colmar, au pied du Mont sainte Odile. Barr is a flower-filled tourist town at the foot of Mount Saint-Odile and the ancient Pagan wall. 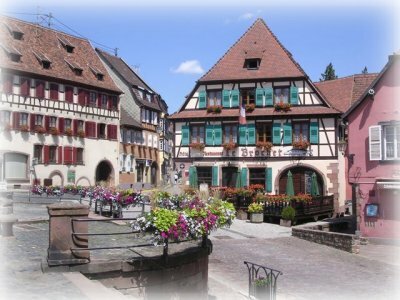 Barr is the wine capital of the Bas-Rhin, situated between Strasbourg (35 km), Colmar (40 km) and Obernai (10 km) on the wine route. Saint Martin's church, "Folie Marco" museum, Renaissance City Hall and interesting wine cellars. Speciality : Grand Cru wine " Kirchberg de Barr ". Strasbourg : the cathedral, la 'Petite France"
Colmar : the "Petite Venise" and the "Unterlinden Museum"